Welcome to Our Daily Bread Designs 6th Anniversary Blog Hop! Our Daily Bread Designs is releasing four new stamp stamps sets today, each of these stamp sets contain Sentiments, Quotes or Scripture Verses that were submitted by the Design Team just for this release. Continue reading below to see how you can win one of 4 Blog Hop Prizes just for leaving comments on the participating designers blogs! The cards I'm sharing today using Our Daily Bread Designs 2014 Anniversary Set, Quote Collection 4. The first card I'm sharing uses the quote I submitted for this stamp set. Here's the front of the card, when slightly closed. To create my card, I cut my card base from Espresso card stock at 5-1/4" x 10-1/2", and scored at 5-1/4". I created a second panel (5-1/4" x 5-3/4", scoring at a 1/2" on the 5-3/4 side). After adding the Bo Bunny pattern paper panels, I die cut the smaller panel using the largest heart from the ODBD Custom Ornate Hearts Die. I then laid the panel over the base card and centered the medium heart in the opening and die cut the heart. 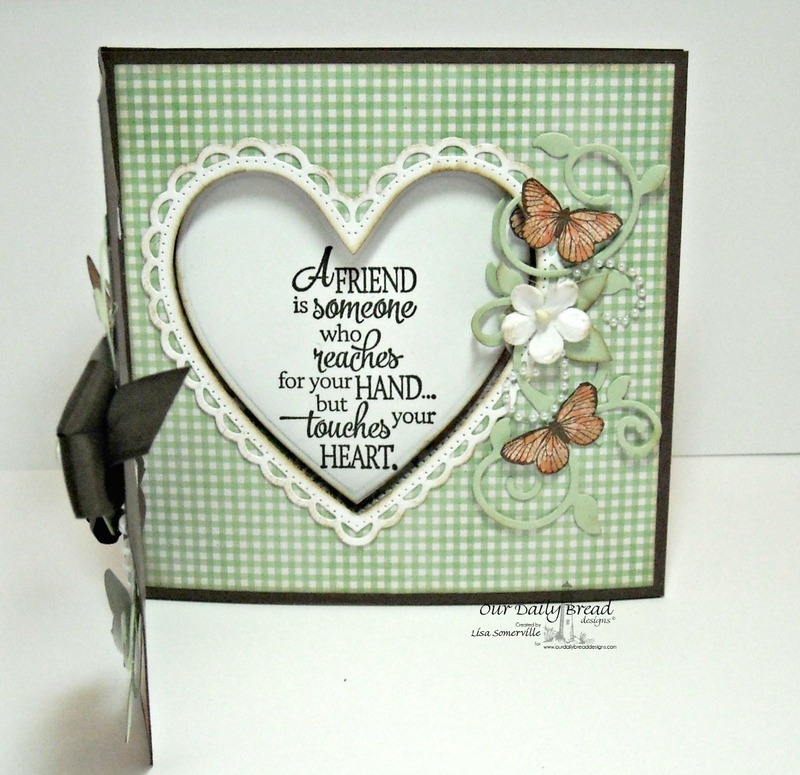 I reserved the heart pieces for stamping/layering inside the card. To assemble the card, I adhered the smaller panel to the large panel with Scor-Tape, then added an Espresso layer with a White panel to cover the seam. To embellish my my card, I die cut the ODBD Custom Fancy Foliage Die from Pistachio card stock, and added stamped butterflies using the Stamped By - Butterfly Mini, Zva Creative Crystal Gems, Prima Flowers and Vintage Brown Seam Binding. 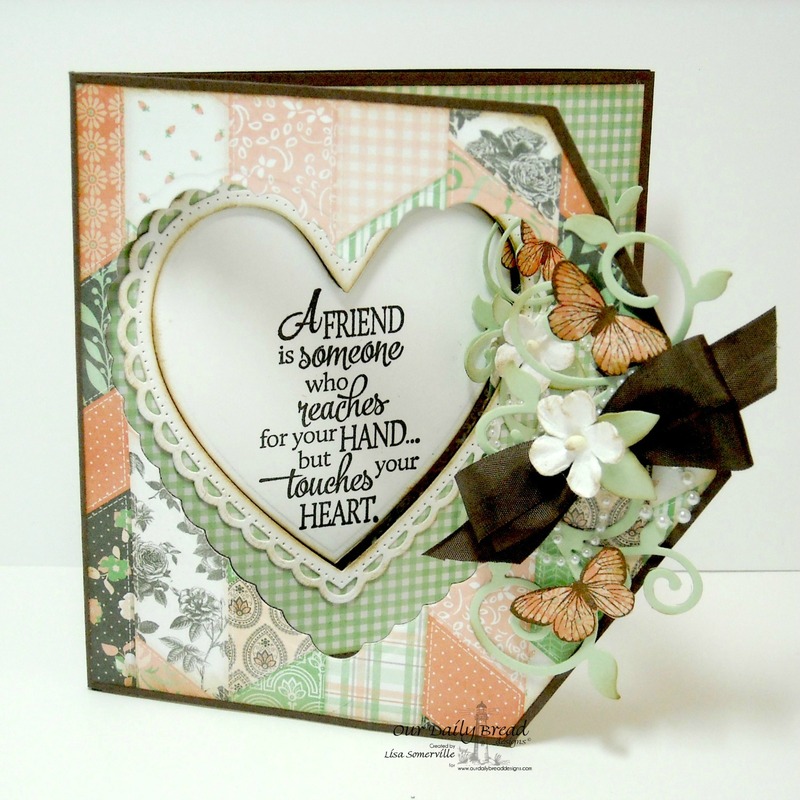 On the inside panel, I stamped the quote from Quote Collection 4 in Espresso ink on the White heart die cut, and layered the stamped panel onto the pattern paper heart die cut. To embellish the inside panel, I also used the ODBD Custom Beautiful Borders Die, cut from Espresso card stock and embellished the side of the heart the same as the front and middle panels. The quote is stamped in Espresso ink on Vanilla card stock and cut with Spellbinders Circle Dies, sponged with Ranger Gathered Twigs Distress ink and layered on an Espresso panel. The pattern paper is from the ODBD Blooming Garden Paper Collection, I cut the top panels, sponged them and layered them on the base panel. The border panel is die cut from the same pattern paper pack, using the ODBD Custom Antique Labesl and Border Die. To embellish I die cut the ODBD Custom Fancy Foliage Die from Olive card stock, added some stamped butterflies using the Stamped By - Butterfly Mini, Zva Creative Crystal Flourishes, Vintage Brown Seam Binding and Mini Roses. As you hop, be sure to leave comments along the way for your chance to win one of four prizes! THREE randomly drawn names from the comments left on the designers blogs will receive a $25 ODBD Gift Certificate good towards the purchase of ODBD stamps, and ONE randomly drawn winner will receive the entire ODBD 6th Anniversary Stamp Set Bundle! The Hop will run from 8am EDT March 17 through 9pm EDT March 18. The winners will be announced on the ODBD Blog on March 19, so you'll want to be sure to check there to see if you won. Wow both of these are fantastic. I love the cut out and the sentiments are perfect for so many different kinds of cards. Wow, Lisa, it is so good to find your pretty designs over at ODBD. You are so very talented and ODBD is one of my favorite companies because of their Christian based inspirations, sentiments, and designs. Congratulations to them for the 6th anniversary! I'm glad God continues to bless them with success! Love your cards, but the first one is just WOZA-mazing! Oh, Lisa, your cards are both beautiful! I have to say the heart card is my favorite because I am in awe of your design and creativity! It's amazing! I just love the quote you chose and know that I will be using it a lot! It's a very special one, and you are special too, sweet friend! Warm hugs! First of all, I LOVE the quote you chose.....one of my faves this year and I will wear it out for sure!!! Both of your projects are super amazing!!!! You really have outdone yourself on both!! Fabulous job, GF!!! HUGS!! Both of your cards are beautiful Lisa. Love the design of the heart one and I am loving the wonderful quote you used. Love both cards, especially the first. thank you, Lis, for submitting that quote! one of my favorites!! your samples are just beautiful! love your use of the Ornate Hearts dies!! Beautiful samples Lisa! Love the use of the heart window on the tri-fold and the quote you chose. That is one of my favorite card designs I've ever done as well... hard to photograph but packs a great wallop in person! Love the second one too, with it's great use of dp and details! absolutely love the heart dies used - coordinates so well with the sentiment! Lovely, especially love the first three fold card! That is fantastic! both cards are gorgeous, but OH MY the first one is beyond gorgeous!!!! LOVE IT!!!! These are great cards and full of wonderful ideas. Love them both. Lisa, both cards are beautiful but I have to admit I absolutely love your tri-fold heart card. Love the sentiment, the shape, colors, the details - just everything about it. Wonderful job!! Oh Lisa! I LOVE both of your cards! That first one though is genius! You are so smart! oh so pretty! love them both and will have to try that fancy fold!!! Both beautiful cards! I am in love with the first one especially because of the soft colors, awesome paper, and that extra panel! Gorgeous projects but have to say my fave is the first! Love the soft corals and greens and the amazing and unique fold of the card! Stunning! Both are beautiful, Lisa! Love the triple panel fold on your first..so clever! And the colors and papers you used on both are wonderful. You always do the neatest different folds for your cards! Love the first one so much! The second one is gorgeous too with the brown bow and cluster of flowers that match your dp. These are both so lovely. Super job! That three way fold card is awesome. Both cards are lovely. I like fold and heart window on the first one. Beautiful cards, I like the card with the hearts. I absolutely love what you did on the first card and thanks for the instructions! The first card is my favorite! It really knocks your socks off! Love all the detail on your cards, especially the heart cut-out one. Whoever receives that is going to be one happy friend! Such beautiful cards! Thank you for the instructions. Wonderful cards!! Love the clever design of the first one! wow both your cards are just lovely. thanks for sharing. With these awesome cards you have jumped started my imagination to hyper drive! I love the soft pastel colors in the heart card especially. A lot of work but a lot worth it! Just gorgeous. Very nice! I really like the tri-fold card idea. Elegant. These are gorgeous! I love the folds on the first one along with the pretty, soft colors. I love the bright, cheeriness of the second one. Great job! Great sentiments & beautiful cards. Just beautiful. My favorite is the first card. All ODB sentiments are great. Love the tri-fold card and the green and brown - such a pretty color combo. Beautiful! Love the tri-fold card. That heart window is a fun touch and looks fabulous! Simply stunning cards. The fold card is really magnificent but the other one is too! Love the sentiments you chose as well. What beautiful cards - both of them. I do have to say the first one just really amazed me tho. And thank you for step by step instructions. I have seen the lovely heart sentiment done quite a few ways now and each one is just special but it is such a great sentiment!! Your second card is very pretty too - background is nice with the flowers ans ribbon. I really love the ODB stamps. Absolutely stunning cards! Love them both! Love your card. Great job! STUNNING CARDS,! Here I am, drooling over your talents! Thanks for sharing! That first card is fantastic! I love the special fold and the window... GORGEOUS! These are beautiful, wonderfully crafted works of love. I love the tri-fold card and the way you incorporated scraps, just stunning. These are so charming, wonderful work! Oh, my goodness, girl! Such beautiful cards. I'm especially studying your tri-fold card. I just have to make one of those. Great quotes too! GASP!!! Your heart card is fabulous, oh my word... Fabulous cards! Wonderful window cards... Great dies! And then your use of pattern papers is exquisite! Beautiful work! Beautiful samples Lisa! Love the use of the heart window on the tri-fold and the quote you chose. That is one of my favorite card designs ...it is a gift in itself!! Your second card is beautiful as well and really shows off the gorgeous paper and details!! Great quote!! Wonderful card designs and I love the placement of the new sentiments on them. LOVE the unique shape of the first card and the 2nd card is FABULOUS !!! I absolutely love the tri fold card!! Beautiful details and design. The dp on the second card is just so lovely!! I love being inspired by your beautiful cards and verses. They are lovely! You keep coming up with good ideas. Thank you. Happy Anniversary, ODBD! Love the tri-fold card! I need to try that! Gorgeous tri-fold card. Love all the details. Great sentiment. Oh my goodness Lisa - these are beauties to treasure!! I love the first with the wonderful soft colors and beautiful design - all your details are to perfection!! And the next card is so beautiful as well - love your flowers, butterflies and flourishes on both too!! I agree with the others- both cards are gorgeous!! Love the unique fold on the first card and use of the heart die- what a wonderful way to highlight that beautiful quote! Both cards have so many details that you could look at for days- tfs!! Beautiful color combos...thanks for sharing such beautiful work. Stunning cards Lisa; thank you so much for sharing. Love, love your cards. Beautiful! Such stunning, creative, inspirational and exquisite artwork with an amazing eye for details! Both cards are quite striking! Beautiful tri-fold card with the heart windows! Lovely color combo & butterflies! Absolutely stunning, Lisa. Thank you for inspiring me. I am always drawn to your gorgeous techniques and unique folds, Lisa! I absolutely love the heart tri-fold and the beautiful way you've highlighted the quote on the second card as well. Fabulous creations! Love the tri-fold card. Great creations. TFS! Wow!! Amazing!! Thanks for the details on how you did the first card! Both the cards are lovely! Wow-these are amazing. The cutouts and butterflies just blow me away. I hope to be able to make cards like this someday! Love your quotes and cards, the triple fold and aperture heart card is amazing. Beautiful cards. I really like how hou did the hearts. You are always so creative. I love your interactive cards - I'm never able to do those well, certainly not as amazingly as you did. Your cards are showcases! Wow-I'm amazed by that first card. I don't know if I have the patience to accomplish a card like that. I love the colorful second card, with all the florals and butterflies-I can't wait for Spring! Great sentiments too! Such Beautiful cards! Hard to pick a favorite, actually impossible! Love the neat fold and top shape for the heart card! Both cards are absolutely stunning - I think I am a bit partial to the stained glass look of the second. We are so blessed to have your great inspiration each week at ODB - thanks for sharing.